Rare Fender Japan Contemporary/Standard Telecaster from the era when Fender Japan WAS Fender. Early Made in Japan C series production from 1985-86, the period when Fullerton had closed & Corona was being built. Sparkle Jet. Factory fitted with traditional Duo-Jet / Silver-Jet specs having Gretsch DeArmond style pickups, a master volume, master tone, 3 way toggle, a volume for each pickup, and G style tailpiece. 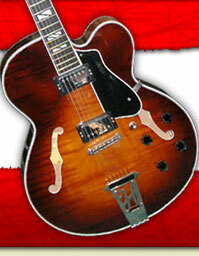 June 1980 , Kalamazoo produced Gibson ES335 , tobacco sunburst finish. Last year of the factory phase switch. Original tailpiece intact, has never been converted to stoptail. Original Gibson hardcase. Straight outta Norlin, natural 1978 Marauder! Lightest example I have ever played/seen. Hard to believe it is solid maple. All original hardware & Bill Lawrence design pickups, pots date from late `77. Original wiring inc the unique blend control. Comes with aftermarket hardcase.